Does your bike have CANbus? 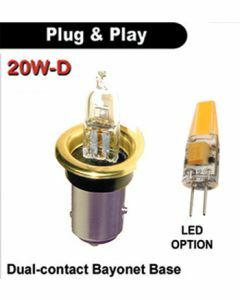 Do you have LED bulbs? Do you want a 3-pin H4 adapter? P115W-H3 unit is totally self-contained. There are no hidden boxes or switches. For some older BMW models, it plugs in-line with hi-beam supply wire. As a universal application, it requires the hi-beam wire to be cut. 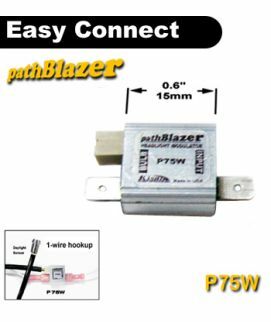 P115W-H3 unit comes with 1/4" Tab male/female connectors and a ground wire pre-installed. 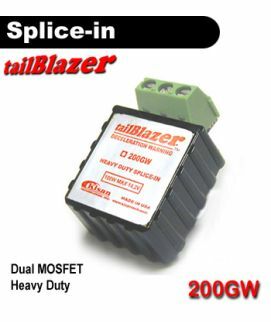 A spare set of matching insulated Tab connectors for universal application is also included. The protective vinyl boot can be removed and the screw-in terminals can be used for direct connections to the bike's hi-beam wire. This allows for a very compact installation. The unit is 1.0" (25.4mm) by 1.35" (34.4mm), and externally mounted. Alternatively, you can choose 3-pin H4 adapter above to get a plug-in product. The adapter will come pre-installed. This is a good choice if you have a small headlight bucket with very tight space. P115W-H3 comes with a detachable daylight sensor, which simply plugs into the pathBlazer. The daylight sensor functions as a switch; it stops modulation when it cannot see enough daylight. Since the internal circuitry is controlled by a microprocessor, it allows for customizable features. 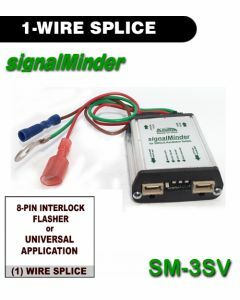 3-Click Programming: If you turn the high beam on and then turn the ignition on three times quickly, the sequence is interpreted as an active command to change the sensitivity. Current software version v.823A allows 8 linear steps between the high and low end.